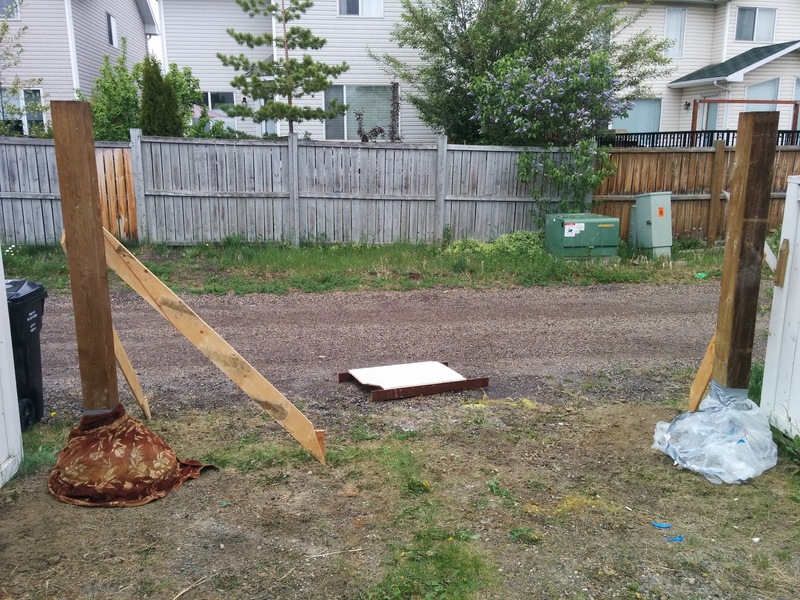 In an attempt to enhance security we have decided to install a driveway gate at the rear of our property. The gate must span 12' with a height above ground level of 6'. 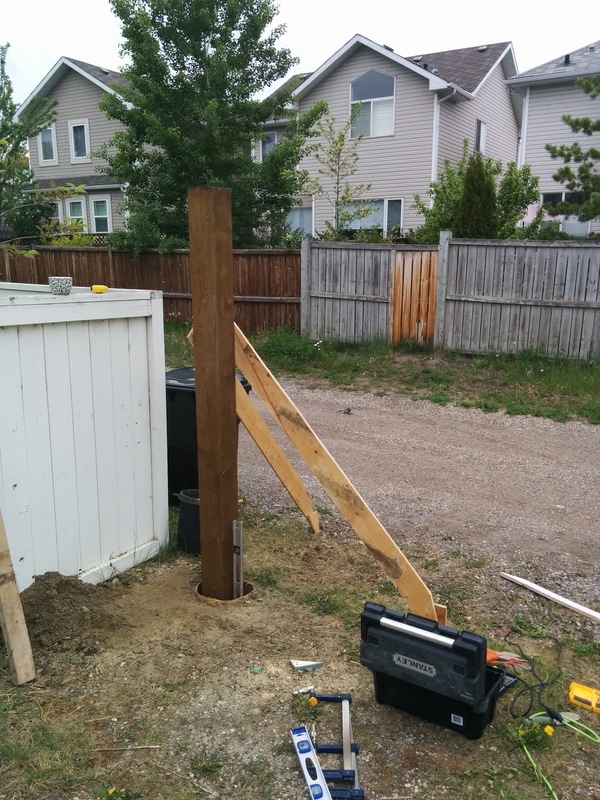 A gate of this size when constructed out of typical pressure treated lumber will weigh a considerable amount and so both the gate and the fence posts must be designed accordingly. I have decided on a fairly typical double gate design with some slight modifications that I hope will enhance rigidity and mitigate sagging. I'll post more about the gate design in a later blog. 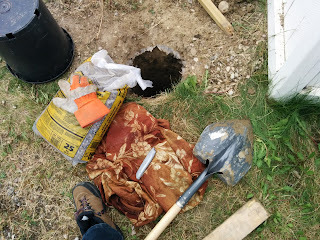 I began by digging by hand a 3'6" hole with an approximate diameter of 12". I pounded the bottom of the hole to compact the dirt as best I could. I used an old 2x4 to do this. The soil is mostly clay. Digging was tough going and took approximately 2 hours per hole. I lined the bottom of the hole with about 6" of gravel, compacting it as I went along. 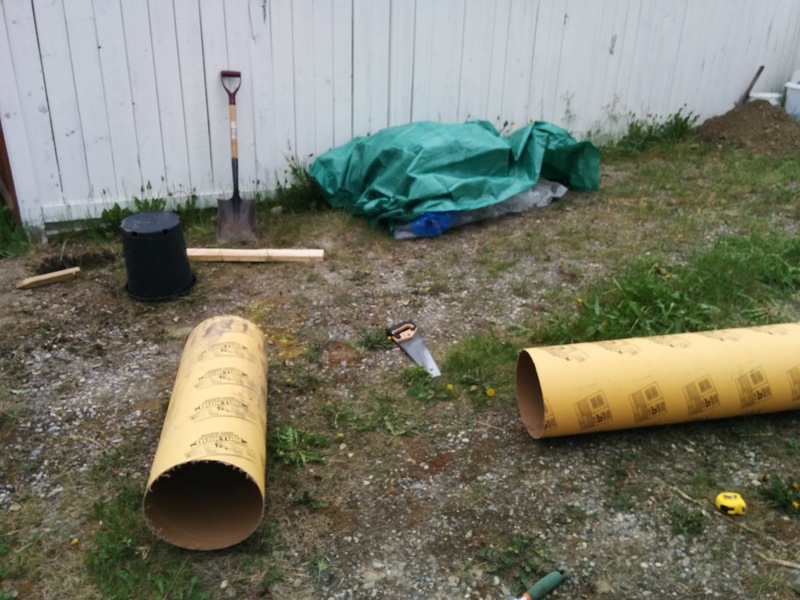 I then inserted the cardboard concrete forms. These were easily cut with a hand saw to the appropriate length. Once these were installed i tried to backfill around them to fill any voids although this is pretty tricky and I'm counting on the ground naturally filling in around it over time. I read much advice about avoiding a cone shaped hole so that frost heaves do not dislodge the post. To me this seemed like a good reason to use a concrete form which would ensure a cylindrical shape. 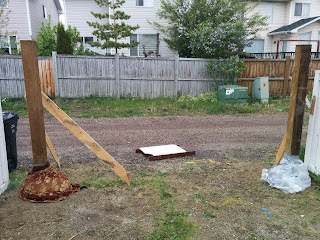 I was working alone so I used my car to back up the 6x6 posts to the edge of the holes and then tipped them into place. 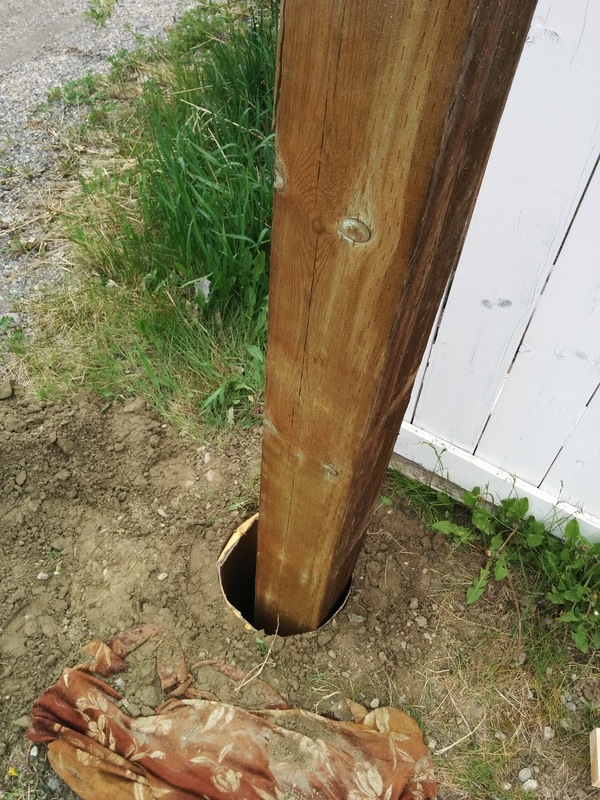 As you can see, the 6x6 post fills most of the hole. Sadly 12" was the largest form I could get. Hopefully this will be enough. I braced the posts vertical using a spirit level to check all sides. Having gravel in the base makes post adjustments pretty easy. I chose to use Quickrete ready-mix concrete which required a trough to mix it in. I didn't have one so I recycled an old melamine cabinet side. I used some 1x4s to form an edge to contain the mixture. This was essential. You'd need a very large flat board if you didn't put sides on it. Fortunately concrete quickly sealed the seams of the trough so nothing leaked out of it. I followed the received wisdom of doming the concrete around the base of the post and slightly above ground level to aid with water run-off. I did this by gloved hand. Here are the final installed posts. 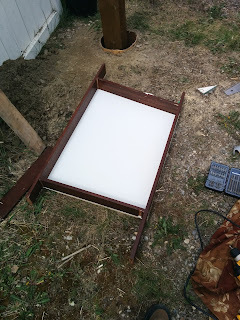 They have skirts on them to keep the rain out which began to fall shortly after I mixed the last bag of concrete. 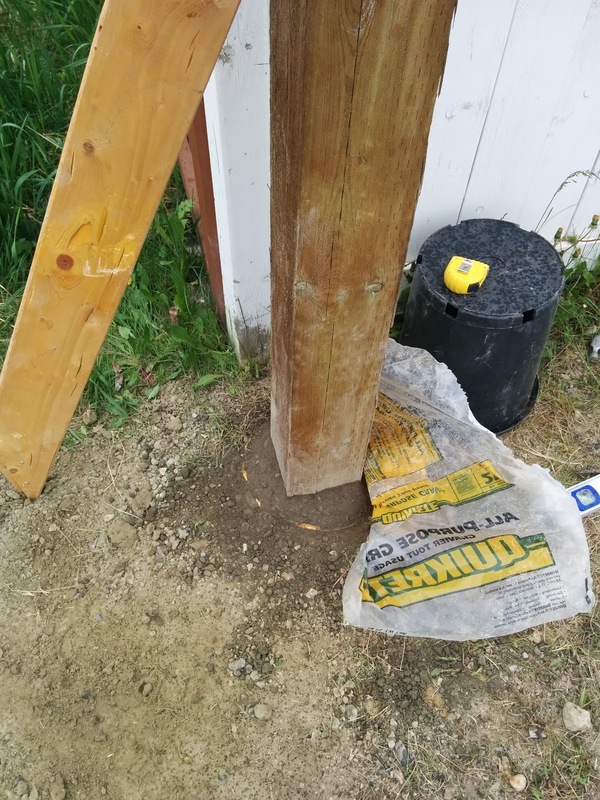 I found each 6x6 post in 12" hole required 3.5 25kg bags of Quickrete. A final check confirmed both posts are plumb. Professional, experienced, and courteous service by a wonderful company. Effectively and efficiently completed residential electrical work. All works great NJ electrical contractor! Definitely recommend and will use again. They completed the job quickly and professionally. Highly recommend! They that work alongside VKB Kitchen and Bath are very mindful as well as friendly. They provide on their own promises and their high quality of work promptly. VKB Kitchen and Bath works with you night and day before you are pleased with all of your choices when the job starts, their group is very attentive to all details; they're also very respectful and are prepared to work around your schedule, Solid group!! Indigo Construction replied immediately, discovered the source from the leak and called in a plumber the same day! They dried out the actual partitions, repaired all of them and the roof coupled with it all painted to match. Residential Remodeling And Commercial Remodeling Portland We highly recommend Indigo Construction for his or her professionalism, promptness and attention to detail.